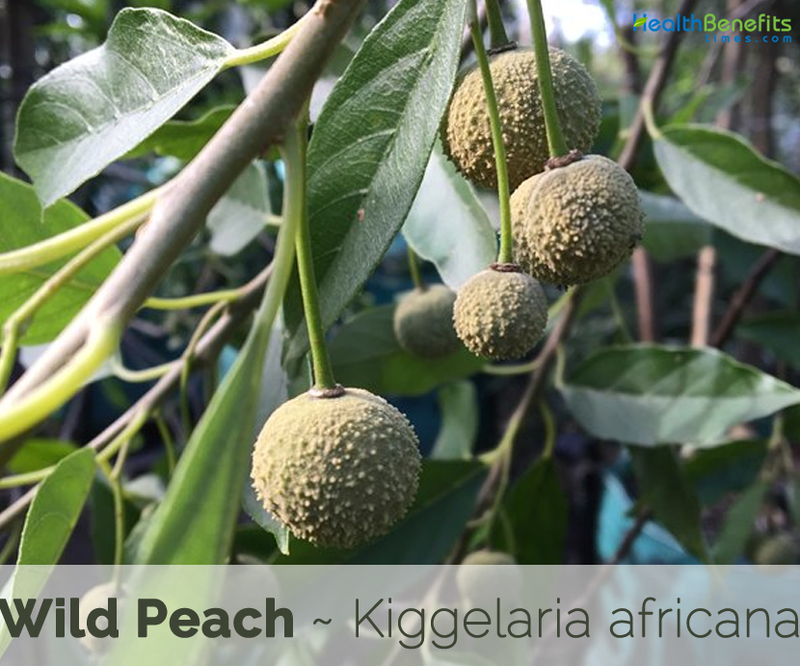 Kiggelaria africana also known as the wild peach or umKokoko is a large, robust, low-branching African tree, and is currently the only recognized species in the genus Kiggelaria. 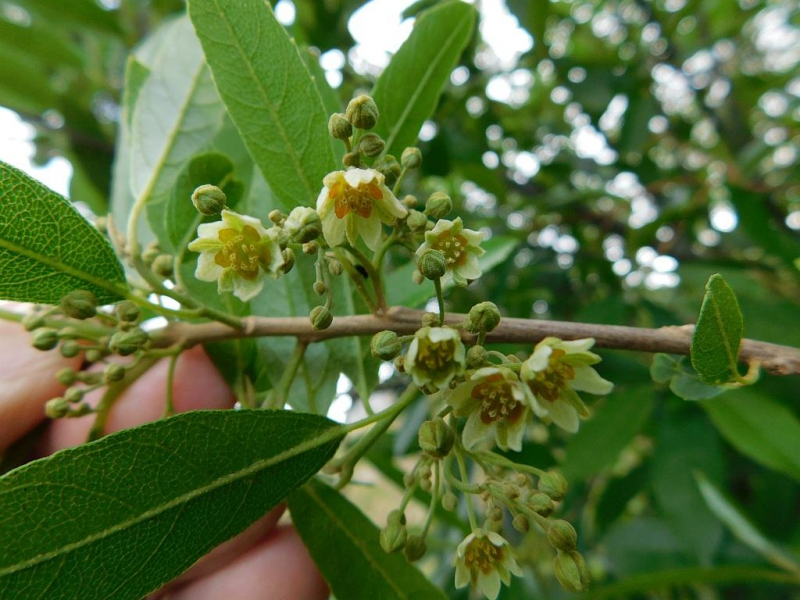 Despite its common name, Kiggelaria africana is not related to the more familiar fruit-producing peach tree (Prunus persica) although the leaves do look similar, if only very superficially. Unlike peach leaves, they are fairly thick and stiff, with a thin coating of fur on the undersides. The tree grows across Tanzania through Malawi, Zimbabwe and Mozambique to Swaziland, Lesotho and southern South Africa. It occurs naturally in Afromontane forests as well as by the coast, in bushveld and along rivers. Few of the popular common names of the plant are wild peach, umKokoko, Porkwood, Wildeperske, Mahogany, Pink wood, Red Ebony, Red Ivory, Red Ivory wood, Royal Redwood and Fatherland’s Redwood. Kiggelaria is actually named after Franz Kiggelaar who was the curator of the Simon Von Beaumonts garden in the Hague (1648 – 1722). africana from Africa. 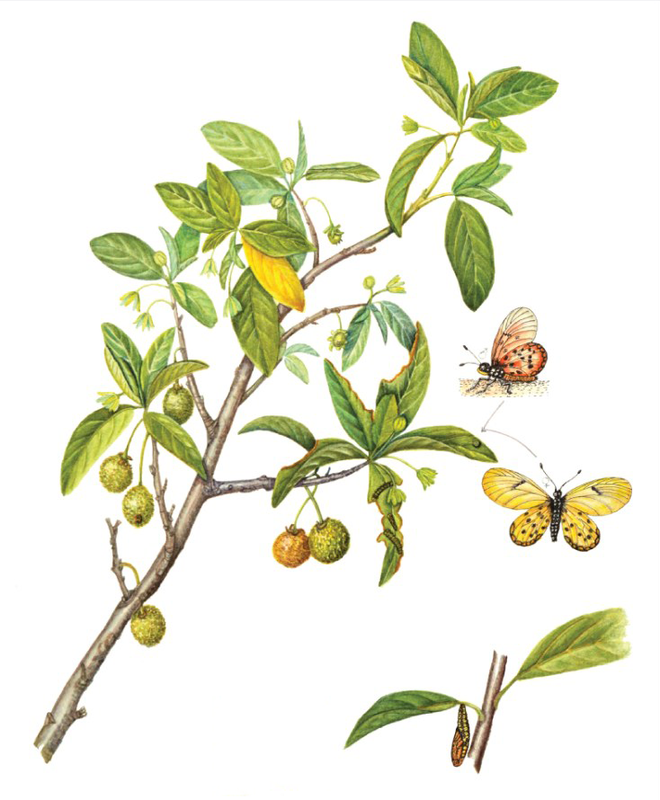 There is only one species in this genus in Southern Africa. 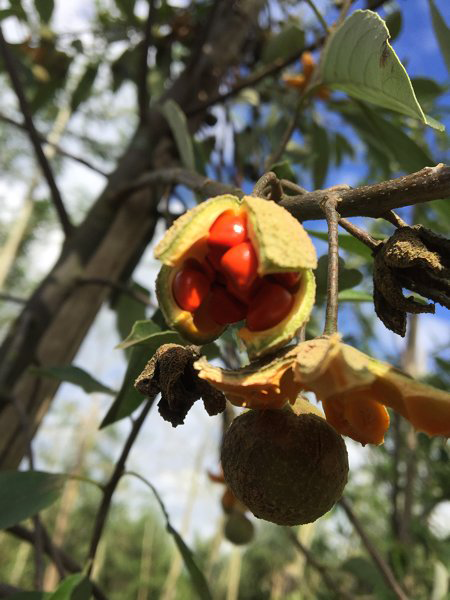 Wild Peach is a large, hardy, well-shaped, robust, low growing, African evergreen to semi deciduous tree that grows about 13–17 m tall and bole branchless for up to 9 m, up to 90 cm in diameter. The plant is found growing in coastal and inland forest, woodland and mountain grassland, along streams and on rocky hillsides and rock outcrops. 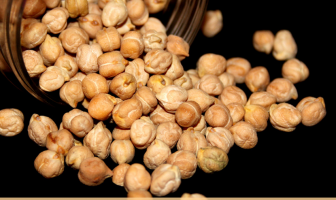 The plant grows in wide variety of soil conditions, from sandy to clay. For optimal development, supply with a soil rich in organic matter, and water regularly, but moderately. It also survives frost. It naturally forms a large shade tree with a gentle, non-invasive root system, but also makes a good windbreak or hedge. If a conventional “tree shape” is required, then the shoots that grow from the tree’s lower trunk should be removed. 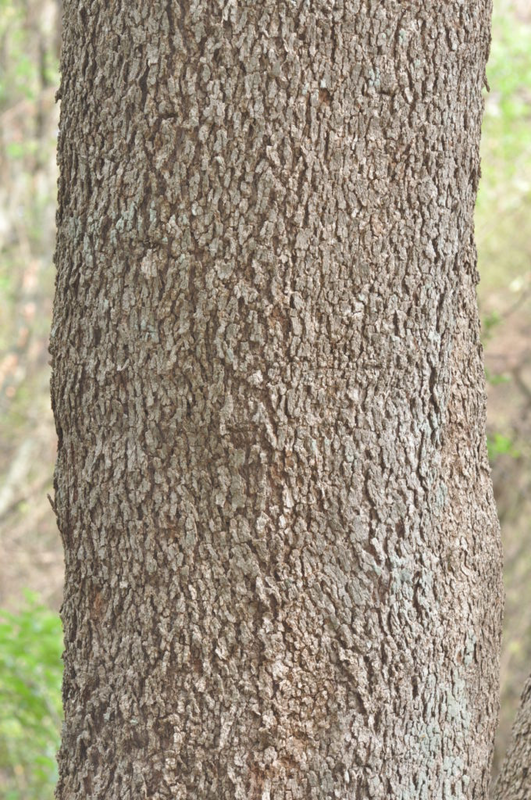 The tree has yellowish brown twigs that are densely covered with very short stellate hairs. 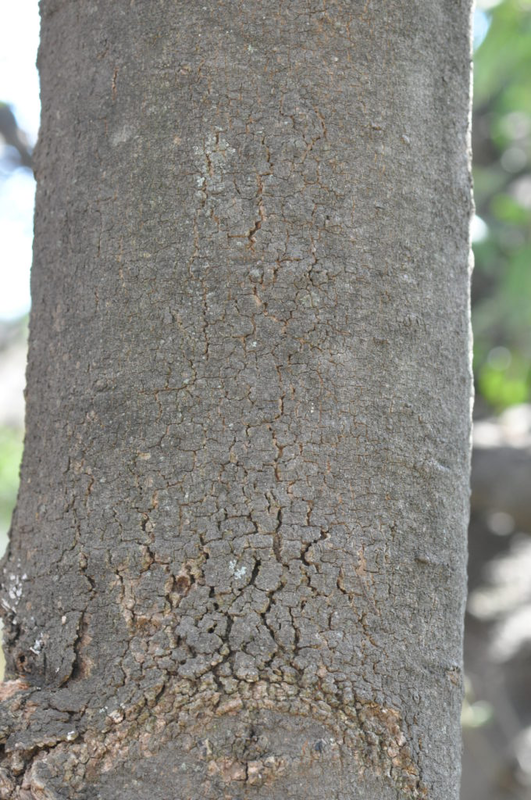 Bark is pale grey to brown, smooth on younger trees, becoming darker and rougher, with occasional scaly patches as the tree matures. Branchlets are striated or grooved, yellowish brown and hairy. Stem is typically straight, and either single or multi-stemmed, and new shoots are slightly furrowed and velvety, with a fine covering of ochre hairs. The plant’s wood is pink, tinged with grey, yellow or brown, medium-hard and medium-heavy and is durable. This tree can easily be propagated from seed. Young plants grow fast and begin flowering after only a year or two. The tree is usually evergreen. Leaves are simple, spirally or alternatively arranged. An occasional bright yellow leaf may be seen. Leaves are oval, oblong to elliptic or even lance-shaped. They are up to 16 cm long and 8 cm wide but usually smaller. Blade is leathery and may be smooth or hairy on both sides. On the upper surface the veins are sunken and a fresh grey to dark green color. Lower surface is usually lighter, blue green, yellowish or whitish and may be hairy. Veins are yellowish or reddish-velvety and protrude below. Lateral veins almost reach the margin. Domatia may be present in the axils of the lateral veins. When present, domatia are fringed with hairs and usually occur on the lower surface. The Apex is pointed or rounded. The base is rounded or narrow. Margins are slightly wavy, entire or unevenly toothed mainly on young and coppice growth. Petiole is yellow and up to 2cm long. Stipules are absent. Hydrocyanic acid has been found in the leaves. 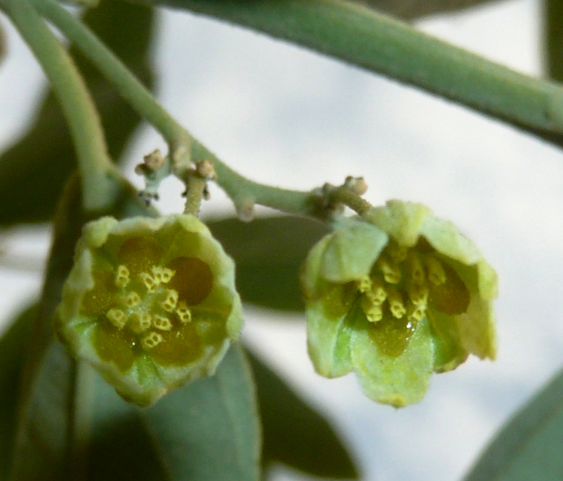 Flowers are small, bell shaped and actinomorphic. Tree is dioecious. Flowers are pale yellow to greenish white and about 1 cm in diameter. The 5 Sepals are almost free. 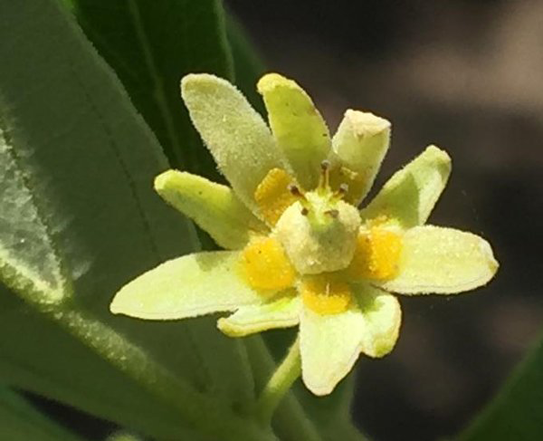 There are 5 Petals, each with a small somewhat fleshy scale attached to the base. Both male and female flowers have longish Pedicels. The Male flowers tend to droop and are in axillary Cymes. They have longish pedicels. The 10 Stamens alternate with the petals and have short Filaments. Their Anthers have 2 pollen sacs opening by terminal pores. The ovary is absent. The Female flowers are solitary, on slender hairy pedicels about 1.5 cm long and situated in axils of leaves. There is a single Pistil. The sessile superior Ovary is pubescent. The Style is divided into 5 branches and is short and thick. 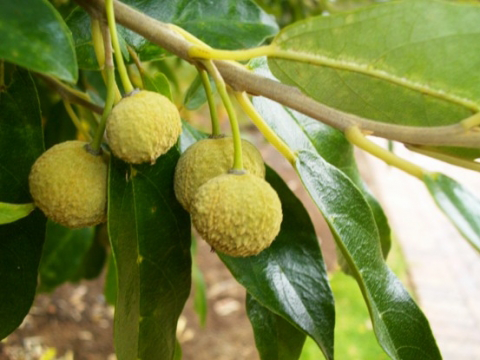 Fruit is an almost spherical, knobbly, olive green, hairy Capsule up to 2 cm in width and perched on a stalk. Fruit is rough and splits into 4 or 5 valves. This splitting reveals an orange to red, oily coat which completely covers each seed. Seeds are black and about 0.7 cm in diameter. The testa is slightly woody. The cotyledons are flat and the endosperm is fleshy. In exposed areas this tree can form part of an effective wind-break, or plant as an attractive specimen tree. Wood is used for flooring, beams, furniture and fairly durable fence posts, and formerly for spokes of wagon wheels. It is suitable for construction, joinery, interior trim, ship building, sporting goods, toys, novelties, boxes, crates, agricultural implements, handles, turnery, veneer and plywood. Previously a pink dye was extracted from the wood; it has been used to color textiles. In South Africa Kiggelaria africana is grown as ornamental and shade tree and as windbreak. The tree plays in role in rituals. 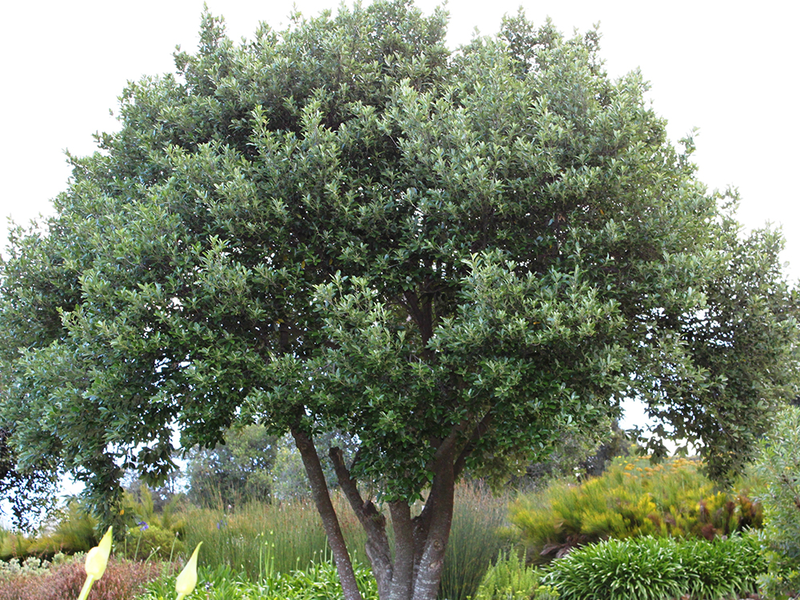 The tree is perfect for large gardens, parks, parking lots and street planting. Stem Typically straight, and either single or multi-stemmed, and new shoots are slightly furrowed and velvety, with a fine covering of ochre hairs. Kiggelaria ferruginea Eckl. & Zeyh. Kiggelaria serrata Warb. ex Engl.